Ensuring Safe School Environments: Exploring Issues--Seeking Solutions presents research findings and information about school violence, with a focus on strategies for increasing school safety. Based on a special topical issue of Rural Special Education Quarterly, the original journal articles have been rewritten to address safe schools from the perspective of suburban and urban, as well as rural environments. Topics include the frequency of violence in these different settings; violence as it directly impacts school administrators; strategies for preventing and addressing violence at both the school and individual levels; and ways to work with the community both in and out of schools. Part I focuses on issues. 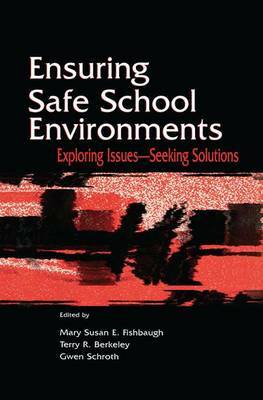 In Part II, solutions that have been used to deal with youth violence are offered for readers to consider, including chapters on effective conflict management practices, behavioral support plans, school-community relations, the development of a caring school community as a way to decrease tendencies toward violence, and a model which demonstrates an in-practice, state-wide program designed to assist in the development of a community-focused school. Each chapter concludes with discussion questions and a case study to enhance understanding of and reflection on the issues surrounding school violence. The text is intended as supplementary material for any course preparing school administrators. Presenting both research and practice, the text can be a guide for practicing school administrators in their search for ways to insure the safety and well being of the students whom they serve, as well as a resource for individuals in other community-based human service agencies who deal with school violence.